Breadline is my all time favorite sandwich place. Fortunately for me, it is only four blocks away from my university's campus- but it is very accessible to the Farragut West metro! Breadline is always bustling with government workers on their lunch breaks. They make the bread on site so it is always fresh, and their menu is simple but they have delicious specials every day like the Shrimp Po'Boy or Portobello Fontina Cheese piadine (italian flat bread). 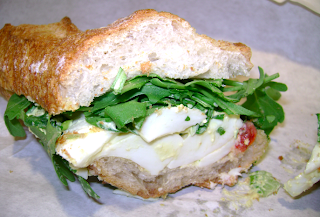 My favorite sandwiches include the Chicken Guacamole, the BBQ Pork sandwich, or the Prosciutto on Walnut Bread. If you are a chocolate lover, try the brownies--to die for! If you are a Challah Bread fan- Fridays they sell 5 dollar challah loafs, so you can make challah french toast saturday morning! Their policy is to get you in and out in no longer than 7 minutes, so don't worry about long lines.